No matter you are on vacation or a business trip, the time on road isn’t that enjoyable, especially for those long-distance trip. At that time, most of us will choose to take a nap and find a comfortable neck support is quite important. Hence, there are lots of travel pillows on the markets, which are designed to keep you cozy and snug while you try to catch some sleep during long flights. Then you might wonder, if there are already so many travel pillows, what make OMNI Travel Pillow standing-out? The Omni-Pillow is made from memory foam, so it should exhibit all the advantages of memory foam. Due to the high quality memory form, you can shrink / fold the pillow into a 6 x 4 x 5 inches (length x width x height) water-resistant shell. And as long as you unzip the shell, the memory form will return to its proper shape quickly. 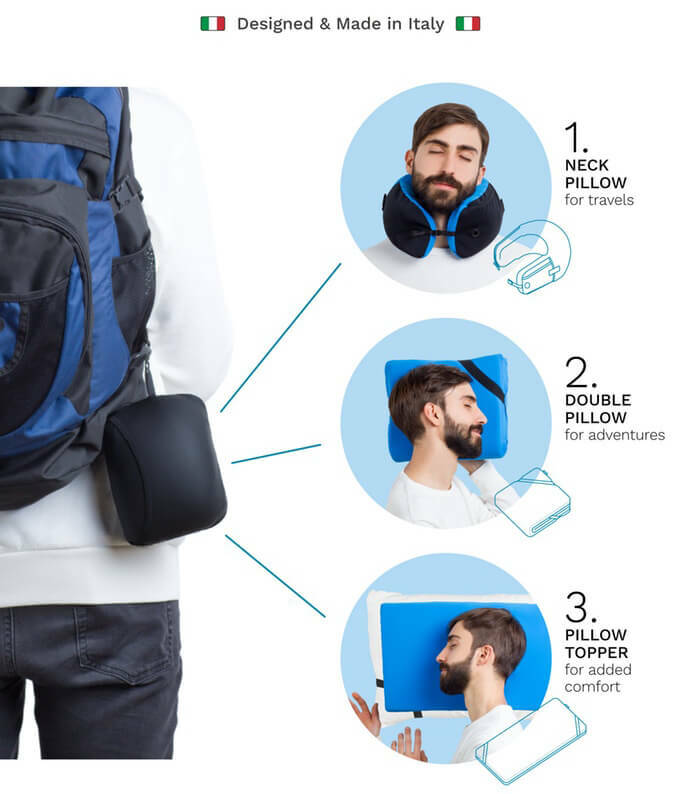 As a travel pillow, it probably need to do what neck pillow does first. It is quite easy to acheive the flexible design of OMNI. Just buckled straps on either end of the pillow allows you to tighten and secure the fit around your neck, while a small pocket on one side lets you keep your phone right on the pillow. There’s even a convenient opening for a cord on the pocket which allows you to listen to music on your phone. Alternatively, you can fold the pillow in half and secure the corners using the straps, allowing you to use it as a reasonably thick pillow, in case you’d rather sleep with your head rested on a table somewhere. The space between each fold even allows you to insert your arm in between. Sounds like I can have a camping and power naps at offices now? Last, if you fully unfold the pillow, it transform into a flat rectangular pillow with 1.75 inches thick. It doesn’t sound like a right height for the pillow right? Yes, it is not much a pillow but it can definitely server as a pillow topper. Straps on two corners of the memory foam lets you secure it to whichever pillow you want to use it with. 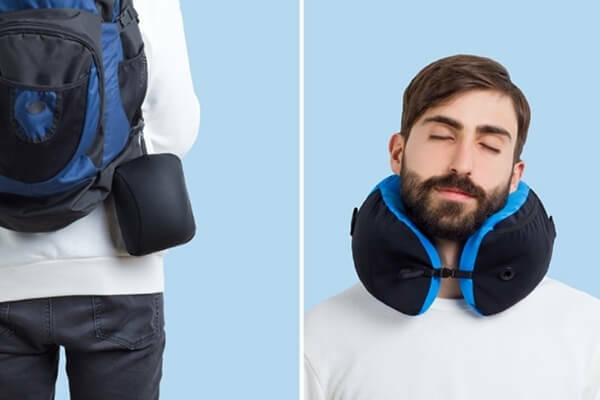 Sounds like a travel pillow you have been waiting for so long? 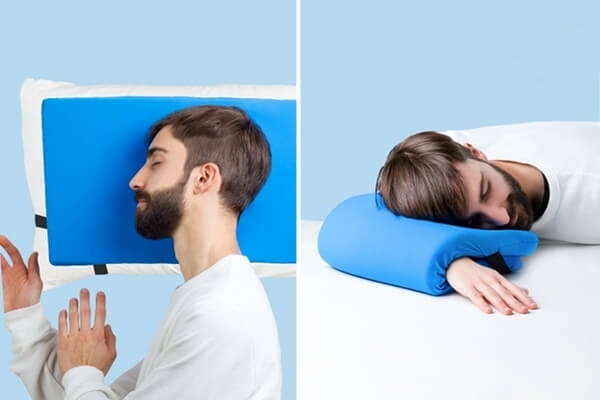 A Kickstarter campaign is currently running for the Omni-Pillow. You can reserve a unit for pledges starting at €45 [pre-order].